Large red color shantiniketan bag comes with multicolored floral prints that beautifies its looks. It have ample space to keep host of useful belongings securely and splendidly. We offer our clients an exclusive collection of Shantiniketan Shoulder Bag that are designed using best grade leather. 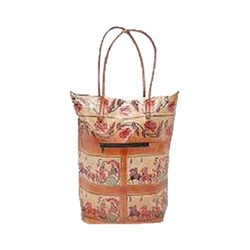 Sturdy & durable, these Leather Shantiniketan Shoulder Bag can be used for all purposes. Combining the utility and beauty together, our range of Marketing Hand Bag is one of the most sought after items in the market. Offered in attractive floral, figurative and innovative designs, our shantiniketan bags are widely appreciated among our clients. Kolkata is well known for its leather bags originating from shantiniketan, thus, we strive to offer bags that are at par with requisite market trends. 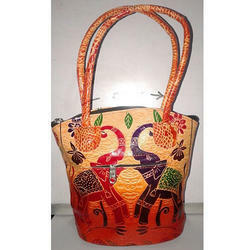 Pretty designs and bright colors are considered to be the uniqueness of these bags.